We couldn't find watermelon radishes! If anyone knows where we can find them in Dallas, please comment below. We used a different type of radish (sparkler radishes that were a bit on the bitter side). This dish was nice, fresh and good -- but really, what cheese-lover doesn't love burrata? But I have to say that it wasn't super-amazing, thus the 3.5 stars. I would make it again using the correct type of radishes. 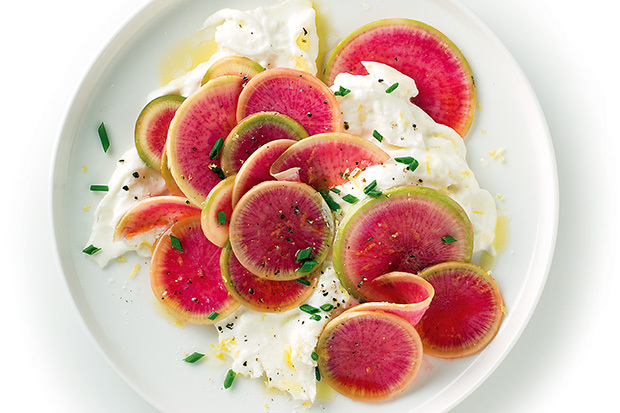 Ingredients for this simple dish include: burrata, watermelon radishes, olive oil, lemon juice, salt & pepper, chives, lemon zest.